I really wanted to get a door sign for the baby’s room – something cute to signify that it’s her lair. Unfortunately everything I saw was just too damn cutesy, where “whimsy” equates to “really curly fonts,” shabby chic, and other nonsense. Thankfully, Etsy came to the rescue again with Rumpelstreet Boutique. 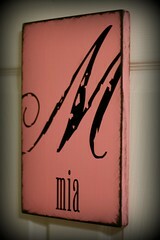 They have a ton of vintage-looking signs that you can personalize with colors and interesting fonts to your taste. I was super pleased when we got the little one’s sign. I chose a pretty tarnished looking script initial with a nice skinny type for her name, both in black, and offset it with a bubblegum pink. It’s also totally sturdy and heavy duty, and very well made. She actually loves seeing it on her door now – when we carry her by she always reaches for it. I hope she enjoys it for years to come! Pretty! Now that we have a real grown up house, I’ve been haunting etsy looking for one of those family “established” signs. You are currently reading Etsy Love: Rumpelstreet Boutique at mingaling.